To avoid a clash, MEP elements (duct, pipe, cable tray, and conduit) need to level up or down. With splitting the elements and input offset/angle value, the app redraws elements to level up or down. 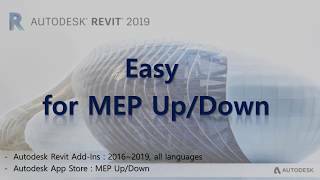 The app works with any language version of Autodesk® Revit®, but the command is English. Works great! Saves me so much time! application parfaite sur le prix correct. fonctionne parfaitement. vous pouvez déplacer plusieurs contenus différents simultanément!